The DoomWorld Cacowards 2018, all in one package -- 43 pages of content, 20 of this year's best WADs! 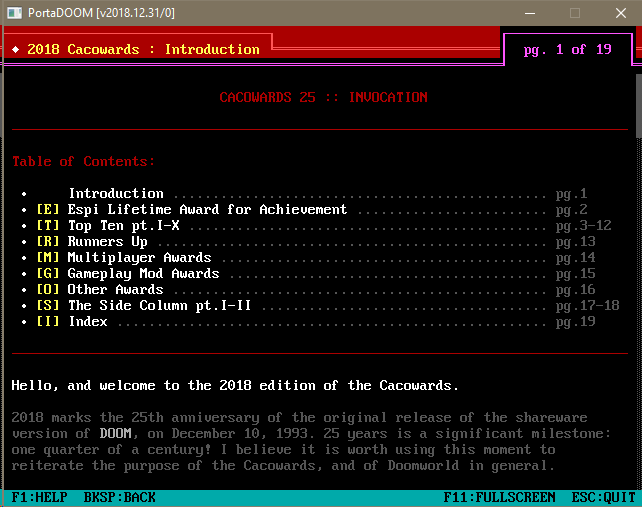 This is marked as "pre-release" because I'm only publishing the Cacowards 2018 package and not the others yet (see previous release below for other PortaDOOM packages); this release represents over a year of work writing a new DOOM launcher from scratch to handle the great variety and complexity of DOOM WAD<->engine compatibility. The all new MS-DOS like DOOM launcher works off of meta-data, giving it far more intelligence in selecting the right compatible engine compared to the old Batch-file launcher. Improvements to this in the future will allow for the user to customize their preferred engine and loadout preferences. This PortaDOOM package doesn't include this year's gameplay mods due to current limitations in the new launcher, but I felt it more important to release the Cacowards now, rather than hold it back for months whilst I work out the mod-loading in the launcher. NB: You do not need to have DOOM or DOOM2 (from GoG or Steam) installed to play. It helps if you do, but it's not required. PortaDOOM is a self-contained, portable DOOM launcher and WAD collection presented as an early '90s MS-DOS disk-zine. If you want to try out the massive variety of DOOM levels out there, PortaDOOM makes this incredibly easy to do.